A mismatched wedding band and engagement ring set is a great way to get creative and express your style. The potential combinations are truly endless. "Mismatched" can also take on a totally different form from person to person. Some may opt for differing metal colors and some may opt for varying diamond shapes. Others shake it all up with totally custom designs. Whatever your style, these five tips will help you on your journey to turn your mismatched inspiration into a reality. #1 White diamonds offer more flexibility when adding a mismatched wedding band. Even though you can definitely pull off a mismatched wedding band and engagement ring combo with colored stones, traditional white diamonds are the easiest option to work with. White diamonds are neutral enough to blend well with just about any color combination you can dream up. They look great with every shade of metal and they keep things looking clean. Colored stones, especially on an engagement ring, make things a bit more difficult when your goal is to mix up your wedding band's look. Even though it's certainly not impossible, it takes more work to be sure that your mismatched wedding ring doesn't clash with a colored stone. Picture a classic round cut white diamond in a solitaire setting with a simple shank. You can easily imagine how much easier it is to seamlessly add a more adventurous wedding band to such a clean, neutral base. Our Abby style is a great example of this type of ring. #2 A skilled wedding jewelry designer is invaluable when exploring mixed metals and stones. In the age of one-click online shopping and retail locations with massive inventories, it can be easy to overlook the advantages of working with a skilled jeweler. The right jeweler makes a big difference, especially when your goal is to get creative with your set. The possibilities can quickly become overwhelming when you're browsing a whole internet's supply of rings. There are tons of wedding bands out there with every shade of gold and diamond shape imaginable. A second set of eyes and an expert opinion can relieve a lot of the pressure that comes with investing in the right one. You're going to have these pieces for a lifetime and it's important to make sure that you make the right choices while getting the most bang for your buck. You'll never regret seeking the input of someone who knows how to help you achieve exactly the set you're dreaming of. Of course, we'd love for you to work with the Honey Jewelry Co team, but this is good advice no matter what quality jeweler you choose to work with. We love to help, whether it means selecting a ring from an existing line or creating a unique, one-of-a-kind piece. #3 Different stone shapes are a simple, subtle way to create a perfect mismatched set. There are more than one ways to create a perfect mismatched wedding band/engagement ring combination than just metal colors. A wedding band with diamond shapes that differ from your engagement ring makes a great companion. This style choice works really well with eternity bands. One of our favorites for this kind of pairing is our own Chloe, a custom oval cut eternity band. It's simple enough to work with almost any engagement ring cut, yet bold enough to make a statement. Maybe you choose a cushion cut engagement ring with a round cut band. Or maybe a radiant cut engagement ring with an oval cut band. There is really no wrong answer as long as the details are right. #4 Wedding band stones should complement engagement ring stones. This is a broad tip and it's a bit open-ended when it comes to interpretation. To put it plainly, it should be a general rule of thumb that any diamonds in a wedding band should work well with the diamond(s) in an engagement ring. This just means getting the scale right. As long as your wedding band doesn't have massive stones that detract from your engagement ring, this is usually an easy rule to follow. The only time that this can really become a problem is if the engagement ring's diamond is fairly small and the paired wedding band has particularly large stones. That sort of sizing difference can cause the two rings to clash. It's also worth it to keep in mind the sizes of secondary stones on the engagement ring. Some multi-stone engagement rings can be difficult to perfectly pair with a large diamond wedding band. If you want to play it safe, start with thinner, daintier wedding bands. Dainty rings (like our Maven wedding band styles pictured above) are almost always easier to match with engagement rings of all shapes and sizes. Once you find a thin band with a style you like, you can always start comparing larger, thicker versions until you find the perfect size. #5 Don't be afraid to express your style in whatever way you dream up. It's great to have some basic guidelines to start with, but there's no hard and fast set of rules for executing the perfect ring combination. A mismatched wedding band is the perfect opportunity to get creative and think outside of the box. We're all about expressing your individuality at Honey and it's our passion to create whatever rings that our clients dream up. It should be no surprise that we encourage everyone to take mainstream, traditional jewelry guidelines with a grain of salt. At the end of the day, your jewelry should be a reflection of you. Allow yourself the freedom to explore different shapes, colors, and sizes. You can't go wrong, especially if work with a jeweler who makes it a point to help you keep everything consistent. Your jewelry will last more than a lifetime, so don't settle for anything that you don't love. We'd love to help you on your journey to find the perfect mismatched wedding band/engagement ring set. This is what we love to do and it's always our mission to work closely and personally to achieve our clients’ dreams. To get started, take a look at our full line of custom wedding bands or our full line of engagement rings. 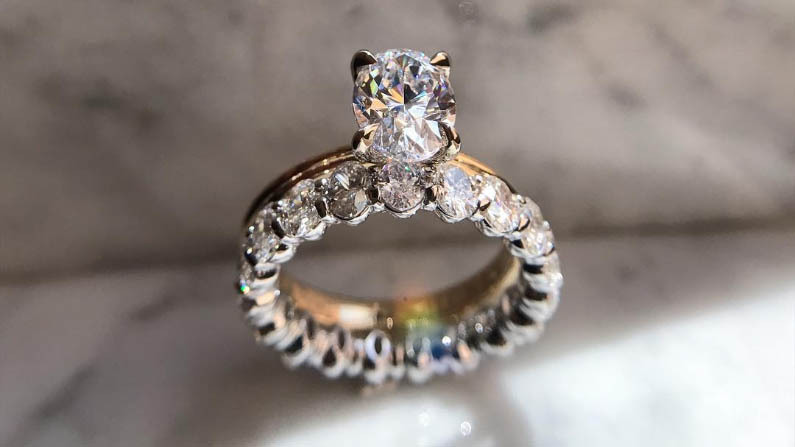 Whether you’re starting from scratch or matching to an engagement ring that you already own, we have the experience and tools to find you the perfect fit.